It’s time to see just how good your highway code knowledge is – which car has right of way in the image below? 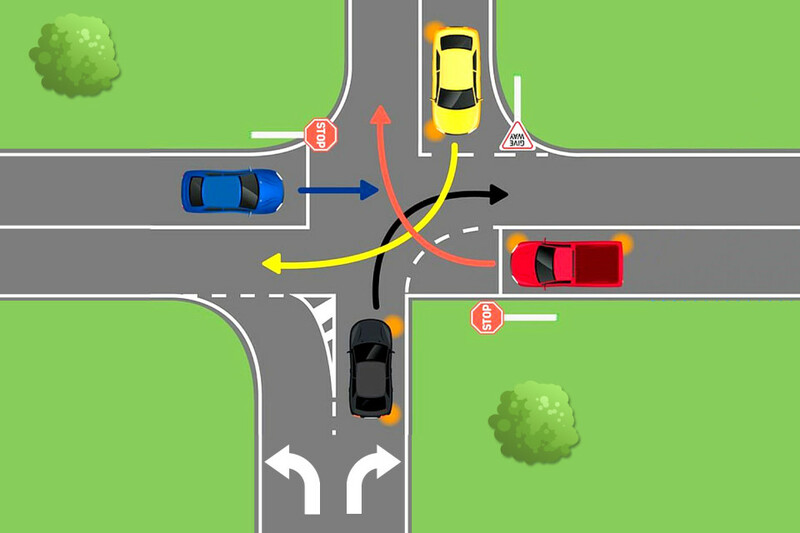 Created by the Royal Automobile Club of Queensland (RACQ), Aussie drivers have been pulling their hair out over who has the right of way in this picture of a four-way intersection – and in what order the red, blue, yellow and black cars should proceed. 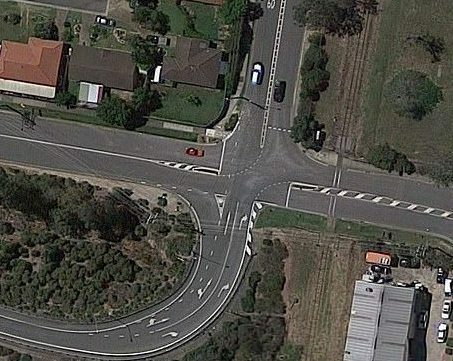 While the challenging quiz image may have been designed for Australia, the UK’s Driver and Vehicle Standards Agency has said that British drivers could also come across such a brainteaser in their daily travels. Why? Aussies drive on the lefthand side like we do plus their driving laws are similar to ours. So who do you think should go first, second, third and fourth? • As the black vehicle is on a one-way street and doesn’t have to contend with any sign or road markings, it goes first. • The other cars are at Stop/Give Way Signs and all wish to turn. • The blue car goes next as it’s not turning with the red expected to give way to its right (as per Aussie road laws), allowing the yellow car to go third. • Once done, the red car can then turn out and be on its way. • … under certain circumstances, the red car could move into the junction once the blue car has driven through. • Also, if the red car is on a major road, it would typically have priority over the yellow car. Although many junctions effectively create one, we don’t have a general give way to the right rule in the UK and I suspect that there will be regional differences in how we manage this situation. Which car goes second would generally be a matter of ‘negotiation’ between the drivers, with a tendency for it to be the blue car, because it has a straight path and is not turning across the path of another vehicle – an unwritten but largely accepted ‘rule’. – Peter Rodger, IAM RoadSmart Head of Driving Advice, speaking to The Sun newspaper. Yes, it makes all our heads hurt a little – but do you agree with IAM RoadSmart? Or do you have another take on the conundrum and giving way to the right? Let us know in the comments.